With this newsletter we are excited to provide you with results from research that you particularly requested through albertapatients. Last December, we conducted a special survey to help us select the topics that community members would be most interested to discuss in the first six months of 2016. The top three picks were: waiting for health care; emergency departments; and seniors’ care. I found the results fascinating and I will be sharing them with the AMA Board of Directors and our system partners. 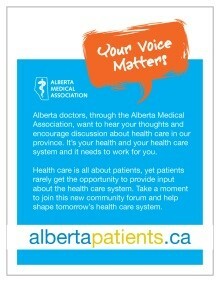 You will be glad to know that, as the albertapatients membership grows and we are able to conduct even better research with more participants, we will also be distributing the results to health care and allied organizations across the province who can benefit from hearing what you have to say. Thank you for your continued interest and participation. Please continue to invite friends and family to join. The larger our community grows, the further the value of what you have to say will go! Recently, we asked albertapatients members about their experiences with waiting for health care in Alberta. We have provided some highlights from the first half of that survey in the Did You Know section, below, and will publish results from the second half in our next newsletter. Wait Times: Patient Expectations and Experiences. 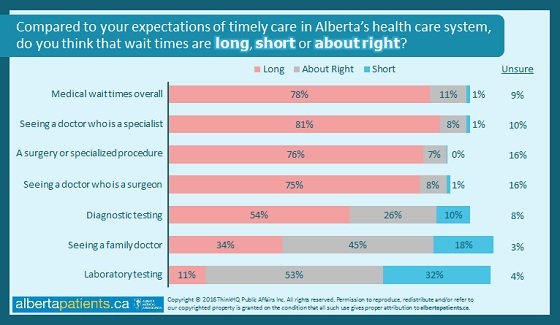 Compared to their expectations of timely care in Alberta's health care system, nearly 4 in 5 patients feel that wait times are, overall, longer than they should be. Some types of medical services stand out as performing worse than others. The majority of patients agree that Albertans are waiting too long to see specialists (81%), to receive surgeries or specialized procedures (76%), and to see surgeons (75%), whereas around 1 in 3 feel that patients are waiting too long to see a family doctor. Over half of patients agree that the wait for diagnostic testing is too long – noting that certain tests like MRIs and CT scans involve a significantly longer wait than other types of tests – and only 1 in 10 feel that Albertans are waiting too long for laboratory services. Only 1 in 4 patients have never experienced a medical wait (not including ER) which they considered to be unreasonable. Of those who have previously experienced an unreasonable medical wait, over half told us that they have waited to see a specialist and around 1 in 3 have waited for surgery and/or diagnostic testing. Although only 28% of Alberta patients told us that they have experienced an unreasonable wait to see a family doctor, the percentage of people who have waited varies significantly by region: over half of rural respondents said they have waited unreasonably long compared to only 17% of those who live in a major city. Views on what is considered a 'reasonable' wait differ by medical service – and those who have experienced an unreasonable delay have waited months (or even years) longer than Alberta patients feel is acceptable. 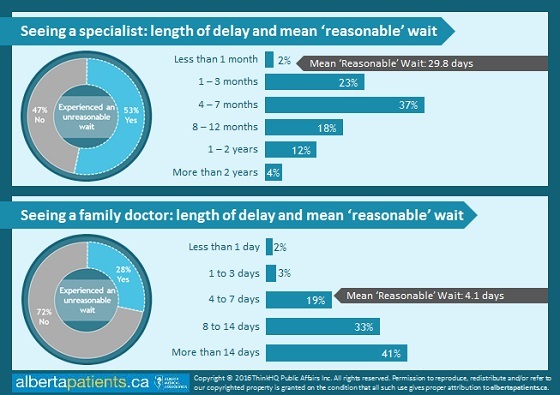 When asked what they consider to be a reasonable amount of time to wait for medical services in Alberta, patients told us that an average (mean) wait of 29.8 days to see a specialist and 4.1 days to see a family doctor would be acceptable.​ Looking specifically at patients who have waited what they feel to be an unreasonable amount of time to see a specialist (53%) or a family doctor (28%), the actual waits they experienced far exceed those targets: the delay most frequently reported to see a specialist is 4‑7 months (though some waits lasted more than 2 years), and between 8 and 14+ days for a family doctor. For detailed results from all of the medical service types we examined, please read the full report (opens in a new browser window).